After four years of hard work the LinkedTV project has been finalized. 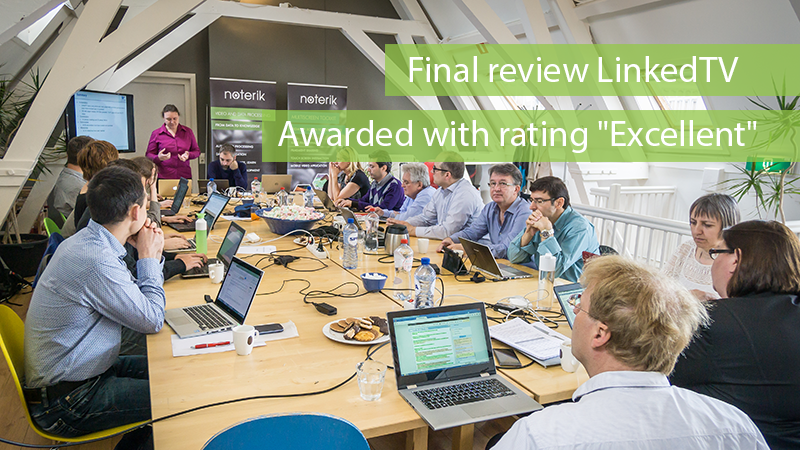 On Wednesday the 13th of May the final review of the LinkedTV project took place at the Amsterdam office of Noterik where all participating stakeholders were joined by the project reviewers and EC project officer Thomas Kuepper. We are very proud to announce the project has been awarded with the highest possible rating “excellent”. The LinkedTV project started in October 2011 bringing together 12 European research and industry experts from 8 countries. The project researches and develops solutions for seamless integration of television and web content, providing an enriched audiovisual experience across devices. Noterik has played an important role in the project by developing the multiscreen toolkit. The toolkit is based on HTML5 and provides a framework for rapid building and prototyping of a wide range of multiscreen solutions. The multiscreen toolkit was used to build the LinkedTV player as well as the media fragment server. The toolkit is designed to be generic and is fully compatible with for example HbbTV. Through the use of a second screen, for instance a tablet, you are given the opportunity to access an entire world of background information related to the broadcast you are viewing. This background information can be presented in various forms, such as audio, video or in writing. The application also allows for users to select these clips and bring them up on the main screen to be shared with other viewers. In other words one has the option to easily move content across screens, devices and users. In this demonstration movie you can see a second screen application that uses the LinkedTV technology to enrich a TV broadcast with related information. LinkedTV can act as an additional layer for TV, similar to the “red button” of interactive TV or the on-demand content of HbbTV, or as an app on Smart TV or mobile devices. The underlying technology has many possible applications in the market. The multiscreen toolkit enables companies to rapidly develop prototypes and working applications. Its use is not limited to broadcasting companies and cultural heritage institutions but can be expanded to include for instance advertising agencies and companies who are active in the field of research where video analysis plays a big role. Noterik is already talking to a number of these parties who have shown interest both in the form of consultancy and the use of the technology.